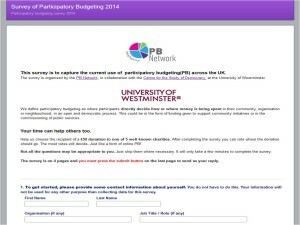 The PB Network is pleased to announce that PB Partners, working in collaboration with the Centre for the Study of Democracy at the University of Westminster has put together a short survey to capture the current state of PB in the UK. We are asking Local Authorities, the Voluntary Sector, the Police, NHS and other public sector bodies to help us to understand the current state of citizen participation in budget setting. Your time can help others too. Help us choose the recipient of a £50 donation to one of 5 well known charities. After completing the survey you can vote where the donation should go. The most votes will decide. Just like a form of online PB! It will only take a few minutes to complete the survey. Not all the questions may be appropriate to you. Just skip them where necessary. The survey is on only 4 pages and all the questions are short.